Shibaken is a clever combination of Japanese Kaiseki and French cuisine, designed for the palates of the numerous Japanese customers staying at the Gallery Hotel. Located on the second floor, it's a well decorate boutique-restaurant with a central counter and a few tables surrounding it. The atmosphere is rather formal as you would expect from this class of restaurant, and so is the service. It is worth noting that this is not Japanese fusion. 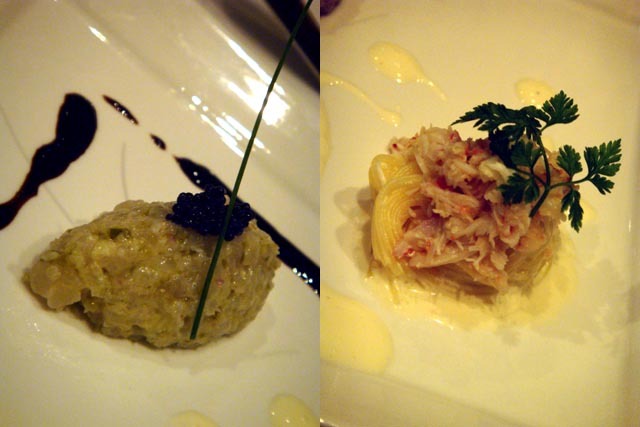 The food is not a mix of French and Japanese, but rather a course of classic Japanese and French dishes. 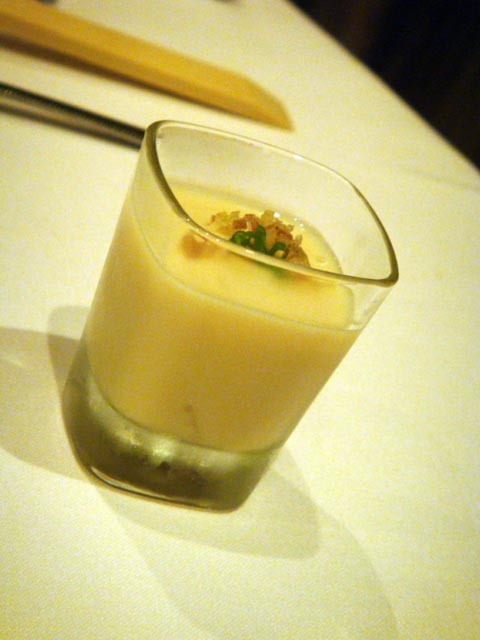 There are two degustation menus at the moment, the "Moody Course" ($88++) and the "Elegance Course" ($138++). We selected the "Moody Course". Apologies for the picture quality, but the lighting was rather dim! Home made bean curd with Japanese Yam - this is a very traditional tasting dish, worthy of classic kaiseki. The tofu is actually gomadofu (sesame tofu), and it's rich in little cubes of crunchy raw and fresh yam. A good opening. Charcoal grilled sweet corn cold soup with cappuccino - I was rather skeptical of this dish when I first read its description. Once I tasted it, I found it to be a sweet surprise. Don't be mislead by the "cappuccino" bit. There is actually no coffee, only a gentle foam on top of the soup. I rate this dish quite highly, the secret being the gentle sweetness of the corn balanced by a charcoal undertone and texturised by the foam on top. Black pork pate' with organic salad - not much to say about the salad, but the pate' was incredibly light and as flaky as a tuna pate'. 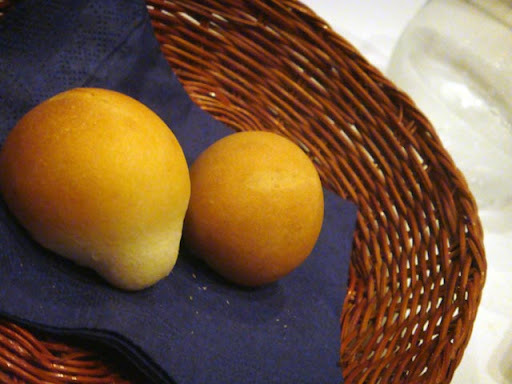 What didn't help was the tough bread below it. I would have preferred a freshly toasted warm slice. Oven baked seabass, sea urchin mousse and spinach covered with pie. Choron sauce - I am not a big fan of this combination. 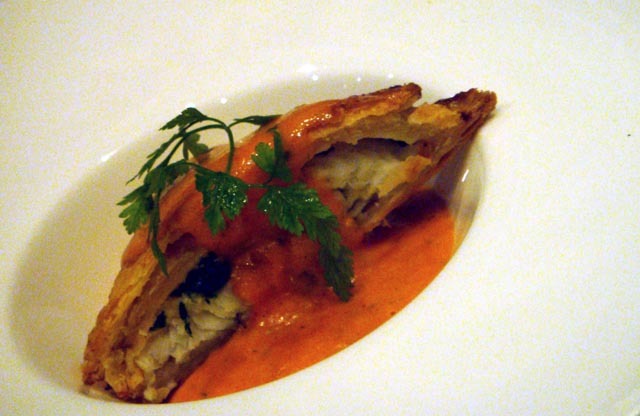 The sea urchin is unrecognisable (if there was any), while the delicate texture and flavour of the seabass are overwhelmed respectively by the flaky, dry pastry and the tangy and creamy sauce. Too many elements blended into an unsuccessful arrangement. Hot fishcake and scallop clear soup with bamboo shoot and chopped Japanese lady finger - as the rest of the Japanese dishes, this is no disappointment. 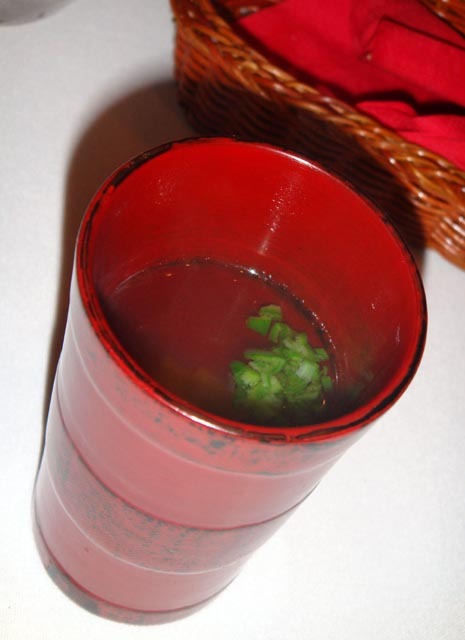 The dashi releases its purest aroma, enriched by a good combination of fresh ingredients. 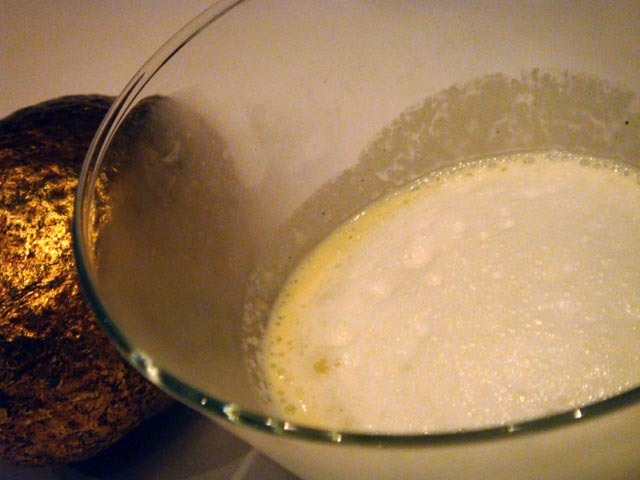 An unmissable dish for any proper kaiseki. 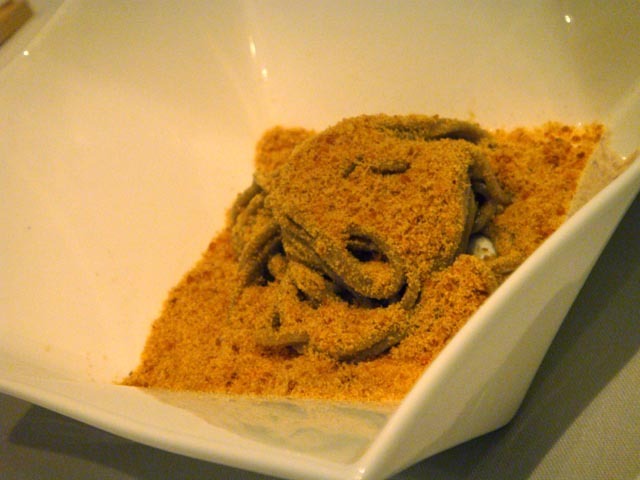 Cold buckwheat noodles with grated dry mullet roe - I was rather curious by the description of this dish. Italian as I am, being a big fan of "Bottarga di Muggine" and knowing how popular this is in Japan (they have their own version from Kyushu called Karasumi in Japanese, basically identical to the Italian one), I can only be interested in having this delicacy grated over noodles rather than the usual pasta. This dish was a success. Being overcritical, the noodles were slightly overcooked. If they had a bit more texture, this dish would have been heaven on earth. Nevertheless, I have no complaints due to the quality of the "karasumi", very generously spread over the noodles. No other seasoning added. Japanese cooking at its purest! Pan fried veal fillet stuffed with Parma ham and sage in veal sauce, stewed vegetable and aubergine gratin with mozzarella cheese - a rather long description for a classic french flavour. The veil was tender and tasty, surrounded by a crispy Parma ham slice and covered in a typical French meat sauce, with a refreshing sage flavoured stuffing. 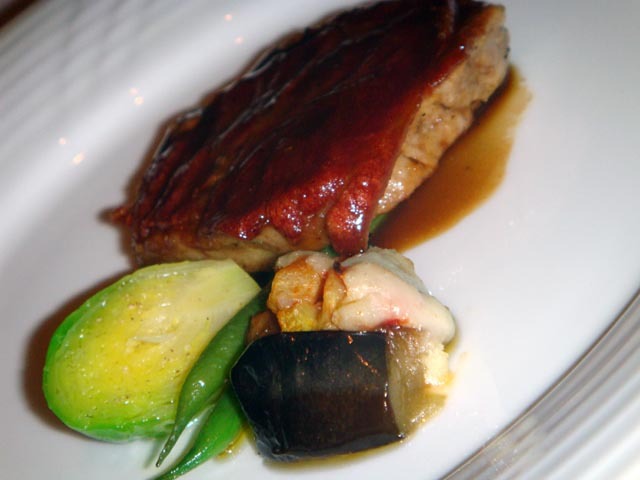 While the stewed vegetable are mainly decorative, the aubergine gratin lacks of body and contrasts in texture. Black vinegar sushi with horse mackerel, with red miso soup and pickles - once again, a Japanese classic with the only difference that balsamic vinegar was used in place of rice vinegar to season the sushi rice. Fish was of the best quality, served at the right temperature. 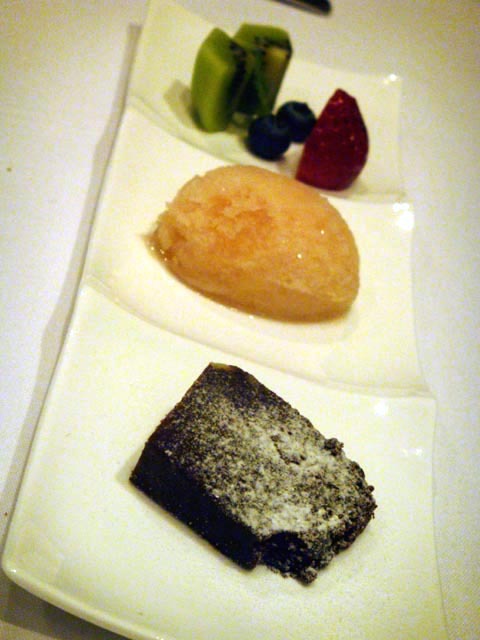 Home made chocolate fondant, white peach sherbet and fruit - Overall a nice, well presented dessert although not spectacular. The chocolate fondant (served at room temperature) is quite rich as you would expect, but the small portion makes it approachable. The peach sorbet tastes very natural and it's for everyone's palate. 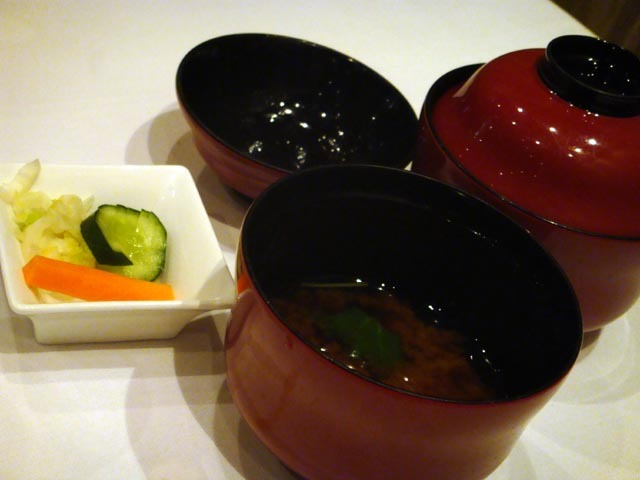 Some might prefer to choose either a Kaiseki restaurant or a French one, and my impression is that this restaurant was designed to cater for those Japanese customers who are attached to their cuisine while willing to experience some western flavours. 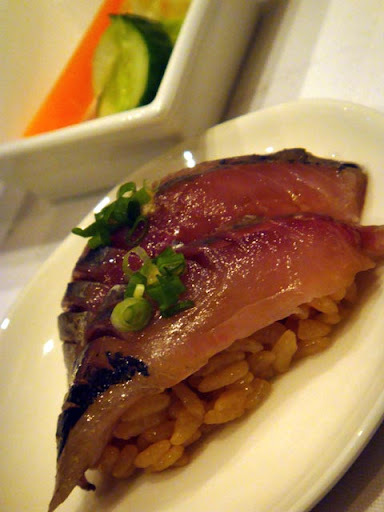 The Japanese dishes are indeed well executed, while the French ones are a bit of a hit and miss. Overall, Shibaken is a positive experience and although (as with any set course) you might not like all the dishes, it is reasonably priced for this kind of fine dining.